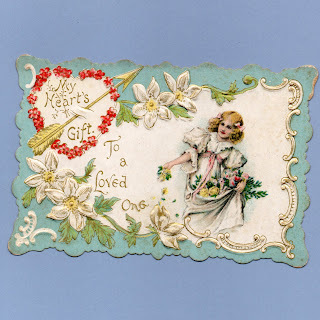 My Heart's A Gift. 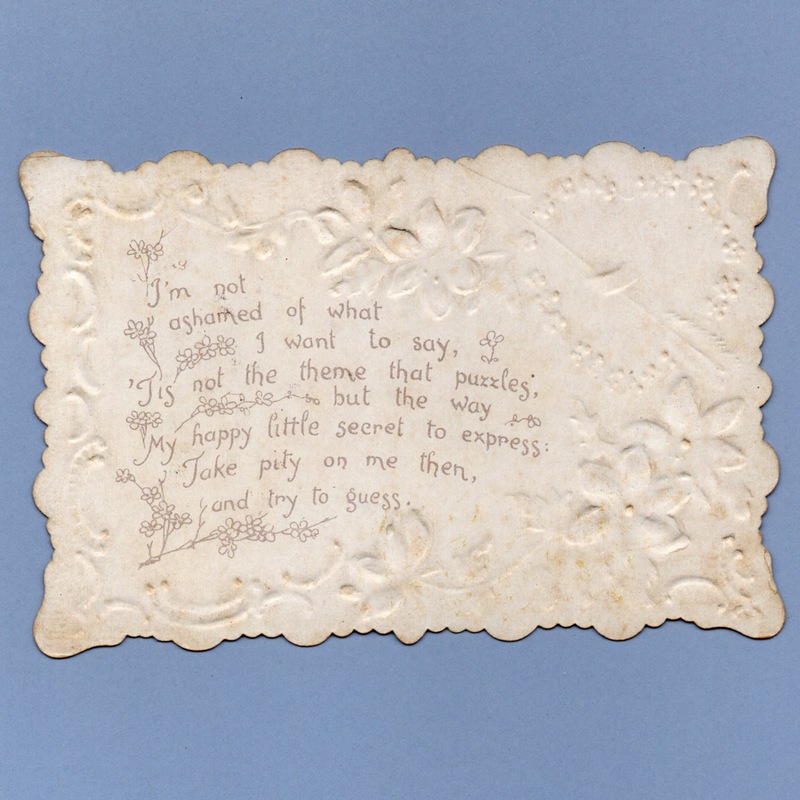 To A Loved One ~ I'm not ashamed of what I want to say, 'Tis not the theme that puzzles, but the way My happy little secret to express: Take pity on me then, and try to guess. 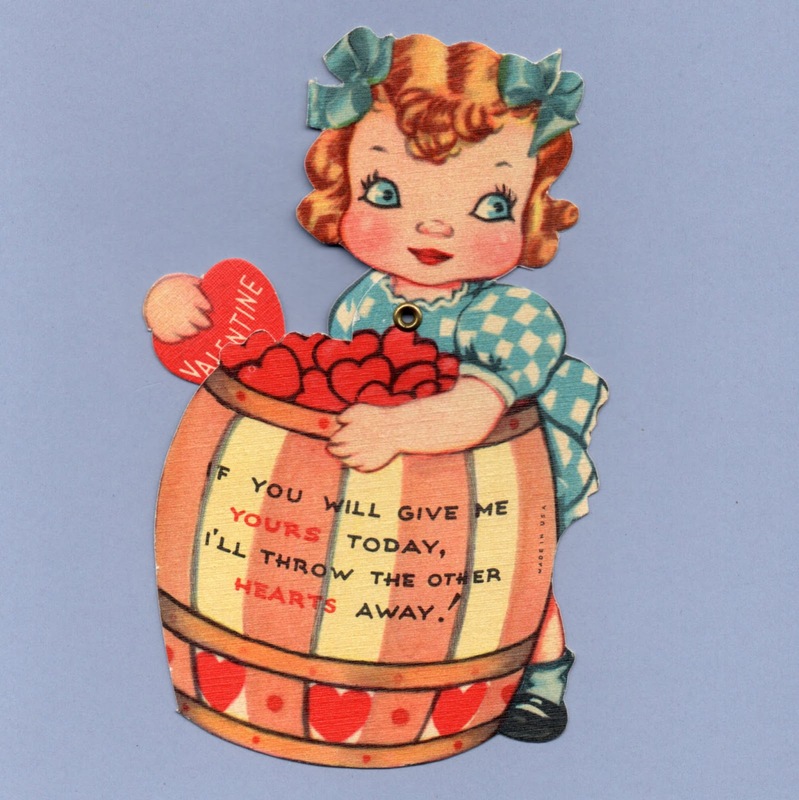 5 3/8" x 3 5/8"
Valentine If you will give me YOURS today, I'll throw the other HEARTS away! 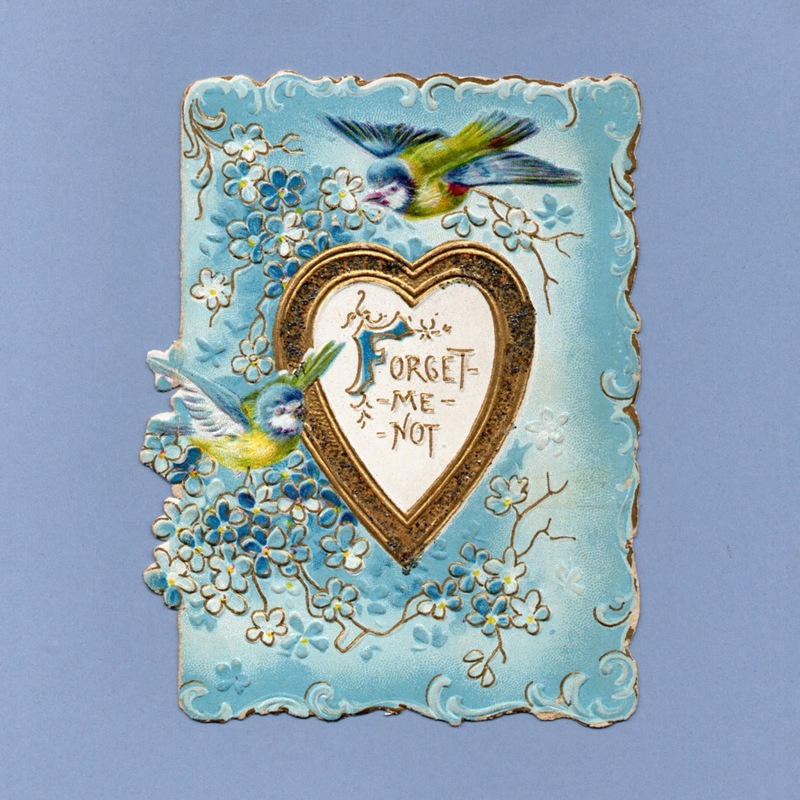 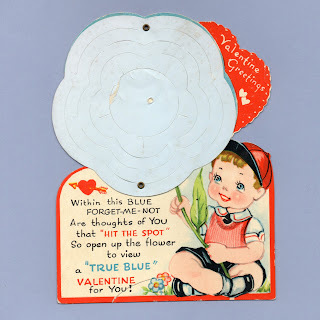 (Message hidden under flower: Forget-Me-Not I'm your Valentine!) Valentine Greetings Within this Blue Forget-Me-Not are thoughts of you that "Hit The Spot" So open up the flower to view a "True Blue" Valentine for you! 2 5/8" x 2 7/8"
To One I Love, I'm like Dopey, trying to peek, To see if your heart is mine to keep. 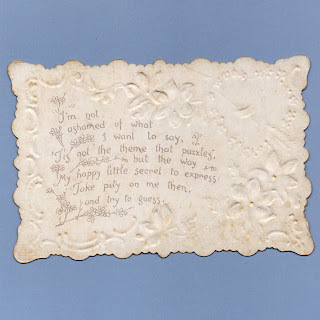 5 1/8" x 4 3/4"
I want you, For I'll confess,You'd bring Happy Happiness. My name is Sneezy and its true I sneeze at everyone but you. If you'll be my Clarabell, My love for you I'll gladly tell. 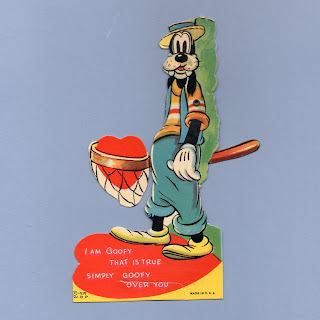 The name's Gideon, my character tough But here is my heart with all my love. 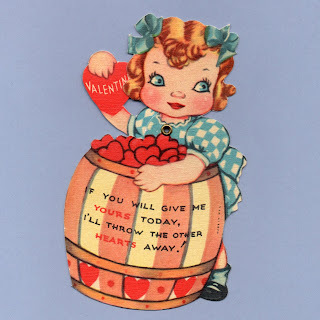 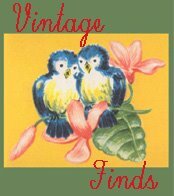 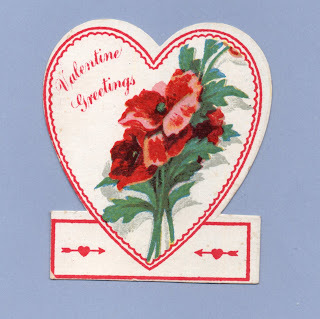 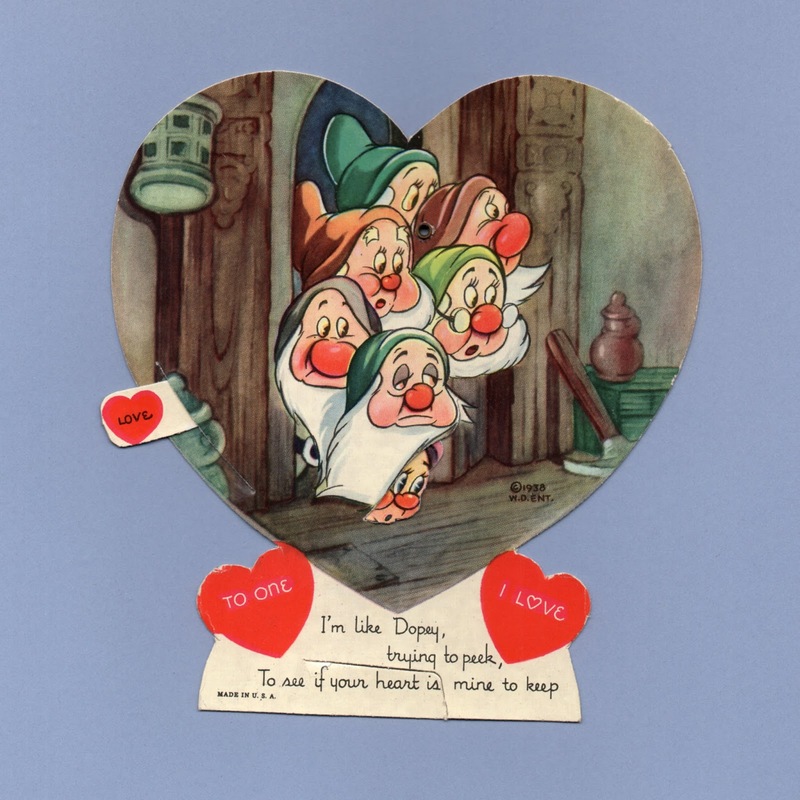 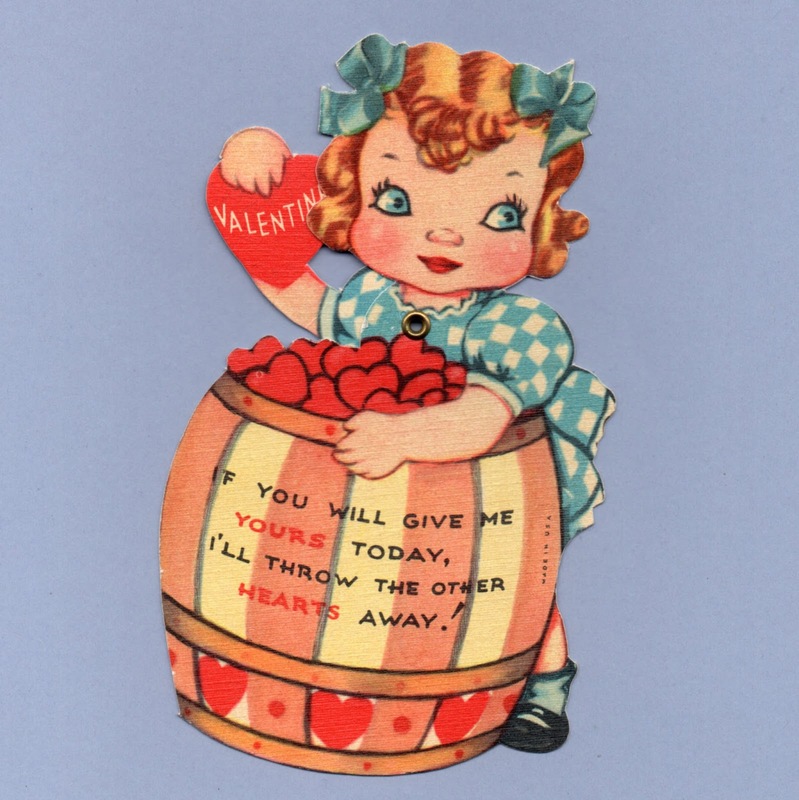 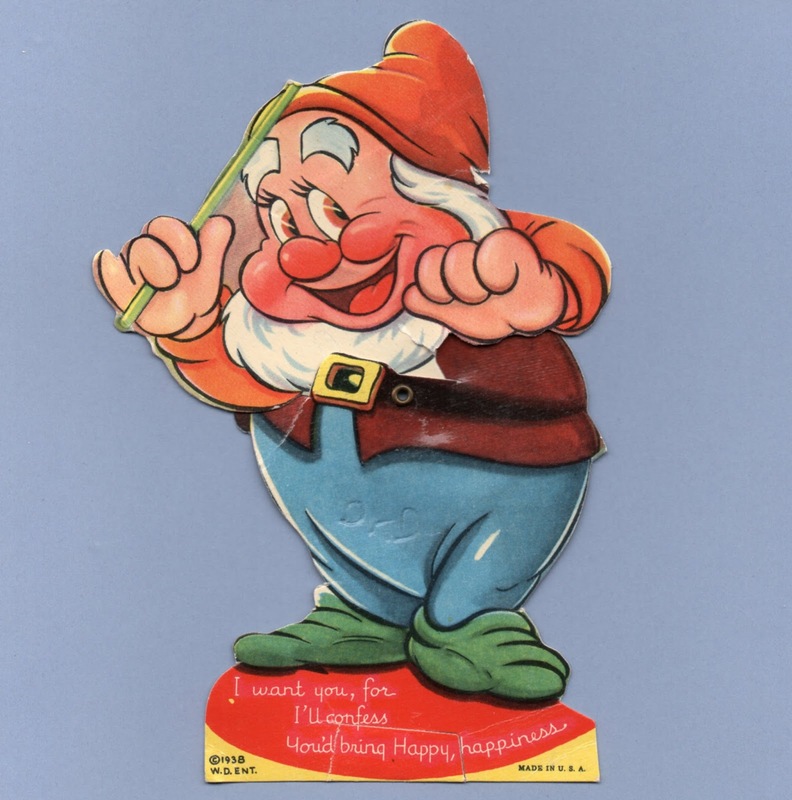 Over the years, Walt Disney has licensed the production of many valentines. 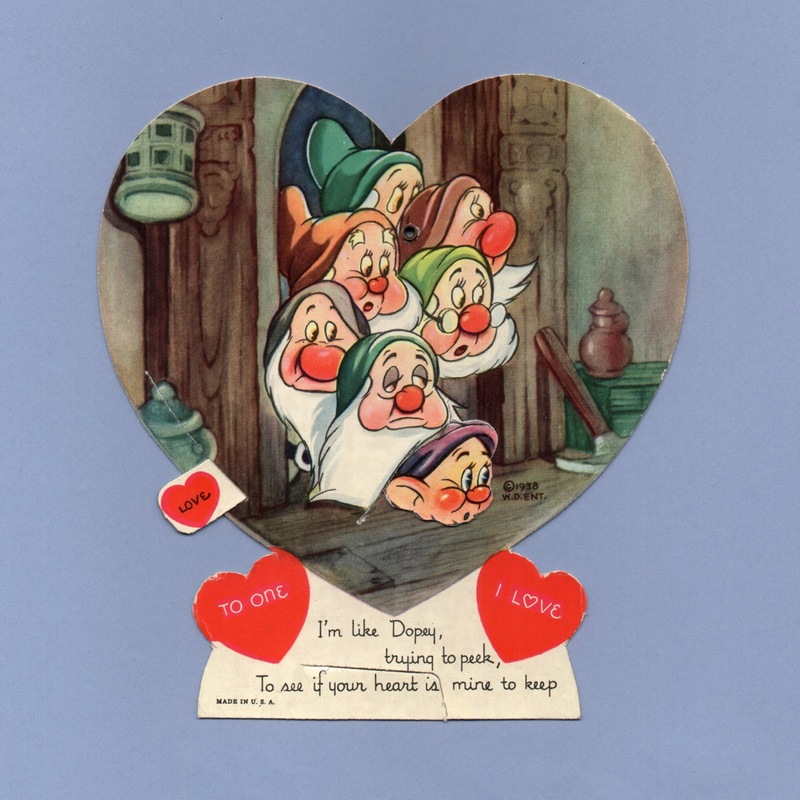 The 1930s saw many different sets produced in celebration of their animated features. 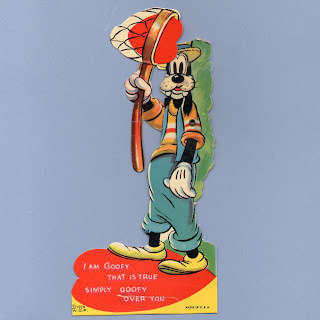 I am Goofy That is True Simply Goofy Over You. 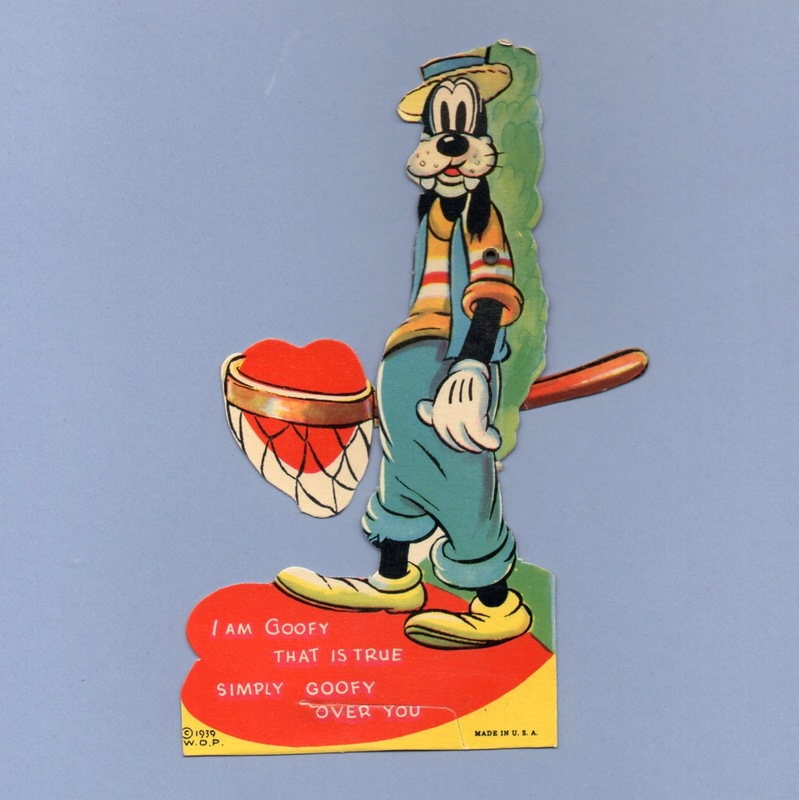 5 1/4" x 2 3/4"
Valentine and Sons created a set of mechanical cards with Mickey and Minnie Mouse in 1938. 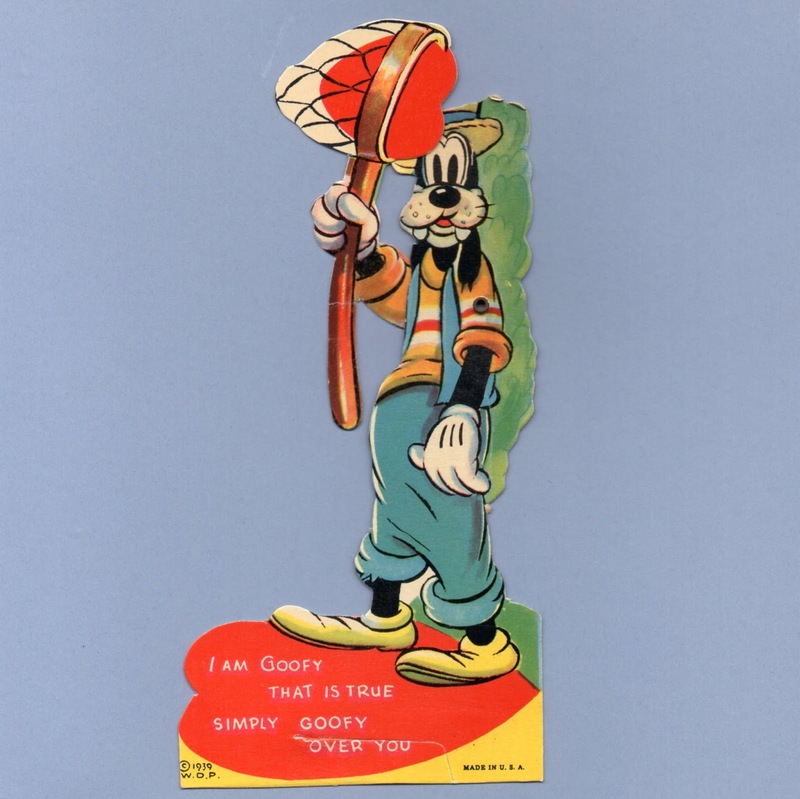 They may be the company who created the other sets of Disney character mechanical cards from the 1930s. 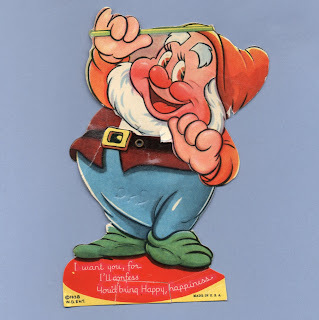 The Hall Brothers (who later became Hallmark) made a set of fold-over cards featuring Mickey and others. 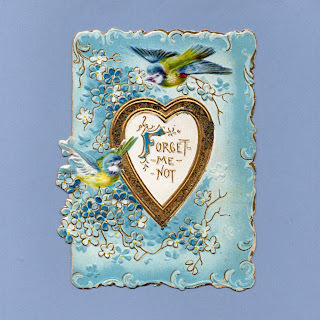 This set is quite difficult to come by.